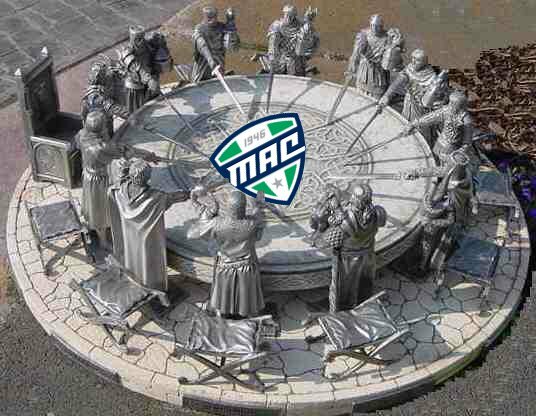 1) Throughout the summer the MAC has been mostly left out of expansion/raiding conversations EMU athletic director Derrick Gragg seemed to hint that there are serious thoughts about adding more team(s). Dust off you DeLorean and tell us what the MAC looks like in 2014. Who stays, who goes and who’s new? What would you’re realistically ideal MAC look like. OTP: In 2014, I expect one of two scenarios. Either the MAC drops down to the normal 12 teams and locks them in for an extended period of time, thus ensuring that the football and basketball will continue to stagnate because all the good programs will have already been snapped up OR I expect the MAC to be slowly withering on the vine and dying. I think that the superconferences that were briefly bantered about are virtually inevitable, and with the exception of maybe Temple, there isn’t a groundswell of support for any of our members to join someone else’s league. Sure, there was talk of Buffalo jumping to the Big East, but I don’t see that being a reality. In truth, the Bulls are not quite “it” enough for a BCS caliber conference, and they are so shoehorned into the MAC that neither scenario makes much sense. 2) Most teams out of conference schedules are now winding down. Who has had the most disappointing and the most surprisingly impressive set out OOC games? OTP: I could take the easy road and say Temple playing close with Penn State, and that was impressive, but for me, the Toledo smackdown of Purdue was the nicest to witness. After Toledo was thoroughly embarrassed by Zona, I expected quite the deflowering at the hands of the Boilers. The most unimpressive results go to the conference as a whole. No signature wins, a couple of FCS losses, and just uninspired play that isn’t helping to bolster anyone’s sense of confidence in the MAC. 3) Which MAC Coach, new or not, should sit upon the hottest seat in the conference? OTP: This is quite the interesting question, if for no other reason than oftentimes the coach that SHOULD be worried doesn’t have to be. Through an interesting mix of circumstances ranging from financial to change, guys like Rob Ianello and Stan Parrish have no reason to worry, but both should. Ron English and EMU started the year well, playing Army and Miami close, but have since sucked it up something fierce against OSU and Central. Perhaps the coach that should worry most is WMU’s Bill Cubit. It isn’t for abysmal results, it’s that the Broncos are just so darned mediocre year in and year out regardless of their talent or skill. 5) Of the bottom five teams which one(s) do you think have the best chance of making some noise in conference this season? And of the top 4 who is most likely to fall apart? OTP: For me, and perhaps this is homerism, Ball State has the potential out of those 5 teams to make the most noise. With a freshman QB in Keith Wenning that continues to get better and a running game that continues to be one of the best in the conference, the Cardinals will surprise people. Mark it down. At the top, Miami and Toledo are not the Temples and CMUs of the MAC, and they will get brought back to reality soon enough.